A public holiday provided the opportunity to visit Wadi Al Abyad with friends. The wadi lies along the middle of the Ar Rustaq-Nakhal loop and the village of Al Abyad can be approached from the north via Highway 1 or from the south a few kilometres past Nakhal. Unfortunately my navigator had failed to advise me that we were supposed to take the latter route which resulted in some extraordinarily bad language from Mrs Pottymouth. We turned off route 13 to As Sibaykha where the paved road turns to concrete and then to coarse gravel and rocks. The palm trees along the edge of the wadi looked a little sad with their brown branches as we clanked through the heavy shale. At the end of the driveable track we left the cars to walk through the wadi that eventually reaches the village of Al Abyad. 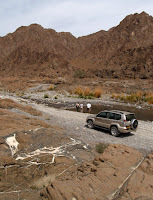 We passed the white calcite pools which give their name to the wadi and continued along the stream accompanied by the unusual sound of running water. I spotted a scouring pad and box of detergent by the edge of the stream, suggesting that the white pools may just be deposits of washing powder rather than a natural phenomenon. Our hike was terminated by a few locals playing with an air rifle. Not wishing to be used for target practice, we ambled back to the cars and drove to the shade of a palm tree for sandwiches (after first removing an abandoned disposable nappy - nice). An hour later, the sound of live ammunition echoed around the valley as an old chap in another group entertained small children with his rifle. When all was quiet, we made a tactical withdrawal out of the valley. It’s always preferable to drive anywhere in Oman between 2-4pm (local post-lunch calorie storage time) and thirty minutes later we were back in Muscat for a nice cup of tea. I mentioned that the pools got their name from the white calcite deposits in the water. 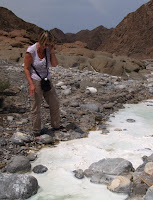 As we walked further down the wadi, I noticed several boxes of washing powder and cleaning materials where the locals had washed cooking pots in the water. Hence the joke about the source of the name.